Pursesnatchers’ debut album A Pattern Language never quite returns to the heights attained by opening track “Forever Overhead”. This is nothing though for the band to hang their heads about. At just over four minutes, “Overhead” is a dizzying, full-throttle tune that at first echoes a defuzzed My Bloody Valentine on speed before shifting gears in its second half to embrace the rapturous chord arrangements of Joy Division. It’s a hell of a song and it feels like we are in for a hell of an album as well- instead of the very good one we are ultimately presented with. Any slight disappointment in A Pattern Language can probably be attributed to how polite and comfortable the rest of the album feels after Pursesnatchers kick the door down with this first track. A four-piece band out of Brooklyn, Pursesnatchers wear their shoegaze influences proudly on their sleeves. Combined with the aforementioned cascading guitars, A Pattern Language features consistently dynamic percussion and some wandering ambient synths that welcomingly take the place of the genre’s ubiquitous lo-fi distortion. Doug Marvin and Annie Hart (too briefly) of Au Revoir Simone split time on the vocals. Marvin’s slightly effeminate inflection recalls that of Beck and Air. It is used to great effect on tracks like “A Parting Prayer” which Beck himself would be proud to call his own. One of the most interesting characteristics about A Pattern Language though is its utter lack of standout tracks- excluding “Forever Overhead”. The tracklist is assembled in an almost rigidly efficient manner. Moods and tones rise and fall, none of the transitions are abrupt. “Lost in Los Angeles” and “Wet Cement”, the only two songs that threaten “Overhead” as an album standout, exude a comfortable calculation that peacefully infects the listener. There is a very seasoned flow to these songs that most bands do not perfect until several albums into their career. 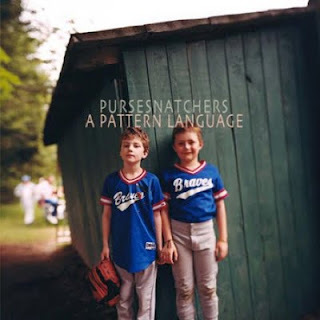 It feels like Pursesnatchers’ awareness of their capabilities has allowed them to create the necessary palette to wow the listener on their own terms. And it is for reasons like this that A Pattern Language comes off as authentically hip, as opposed to merely hipster. A Pattern Language will be released on July 19th. Click here to check out their first single "Wet Cement".